The 115 V AC power socket operates on high voltage. Use the 115 V AC power socket in the vehicle with the same caution and care that you would take with power sockets at home. Keep fluids away from the 115 V AC power socket. Do not use liquids or sharp tools to clean the power socket. Keep the cover of the 115 V AC power socket closed when not in use. Otherwise, you could suffer an electric shock and be seriously or even fatally injured. Any device that you connect must have a suitable plug and meet U.S. standards. Never pull at a cable to disconnect a plug from a 115 V AC power socket. Never use a damaged connection cable. The 115 V AC power socket must never be connected to another 115 V AC power source. Do not use a converter with an earthed plug for the 115 V AC power socket. This could cause serious injury to you and/or other people. If the 115 V AC power socket is damaged or pulled out of the trim, do not use or touch the 115 V AC power socket. The use of a 115 V AC power socket that has been damaged or pulled out of the trim could cause serious injury to you or others. 115 V power socket 1 provides an AC voltage of 115 V so that small electronic devices can be connected. These devices, such as games consoles, chargers and laptops, should not consume more than a maximum of 150 W altogether. Requirements for operation of these devices: • the 12 V sockets in the rear compartment and the cargo compartment are operational . 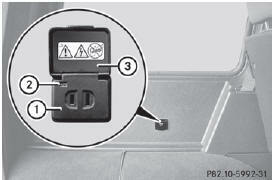 • the plug of the electronic device is plugged into 115 V power socket 1. • the on-board power supply is within a permissible voltage range. • the electronic device's maximum power output does not exceed 150 W.
► Insert the plug of the electronic device into 115 V power socket 1. Indicator lamp 2 lights up. If indicator lamp 2 does not light up, please read the section on malfunctions. ► To turn off: disconnect the plug from 115 V power socket 1. Ensure that you do not pull on the cord. Possible causes of malfunctions: • the on-board power supply is not within a permissible voltage range. • the temperature of the DC/AC converter is temporarily too high. • some small electronic devices have a constant nominal power of less than 150 W, but a very high switch-on current. In that case, there is a possibility that these devices will not function properly as 115 V socket 1 is not able to provide a high enough current. ► If indicator lamp 2 still does not light up, contact a qualified specialist workshop.